The Terminal Complex of Ankara Esenboga International Airport constitutes a four-level building with Arrivals, Mezzanine, Departures levels - divided by Domestic & International terminals (& small VIP terminal) - International Terminal to the right, Domestic Terminal to the left. Each terminal has 18 passenger bridges, and both have a total of 105 check-in counters and 34 passport counters. Airline gates are numbered consecutively - starting with gate 103 to the left, gates 113/114 in the center, and gate 120 to the right - while access to gates 301/304 downstairs is near gate 110; and access to gates 401-406 is downstairs inear gate 116. The International Arrivals level has a duty-free shop, passport control, baggage claim, Customs, busgate kiosks, cafes, & banking facilities. 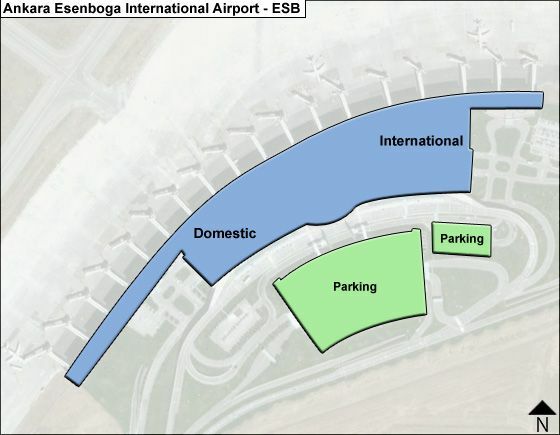 The meeting point is in the center, between domestic & International arrivals. Transfer between the terminals is mainly on foot by means of escalators, elevators and moving walkways. Due to a limited number of golf carts avalailable, precedence is given to infirm passengers. For Visa Information, contact the 'Republic of Turkey Ministry of Foreign Affairs / Visa Information for Foreigners'. The Exit tax sticker can be purchased at the Treasury desk near Gate B on the international departures level. Services and amenities in both terminals include food & drink and retail concessions, duty-free shops, VIP/airline lounges, banking facilities, travel agencies, a prayer room, and rental car desks. Left Luggage on the Arrivals Level can be contacted at +90 312 590 4000, ext. 7518. - Ankara lounge - a renovated & expanded Turkish Airlines domestic lounge - represents actually two connected lounges - one named 'Business for Business Class Passengers', and the other named 'Elite for Elite Plus Members'. - Anadolujet 'Prime-Class' Lounge in the domestic terminal accessible to Turnkish Airlines passengers, and to preferred bank or company cards; however it also functions as a pay-in lounge for any passenger with a boarding pass. - Comfort Lounge is operated by primeclass CIP Service. It serves Lufthansa, Pegasus & Azerbaijan airlin epassengers at discounted fee and the any ohter passenger can use it at regular fee.